Burnley U23’s picked up all three points at Curzon Ashton’s Tameside Stadium with a 1-0 victory over Barnsley in the Professional Development League on Thursday evening, extending their unbeaten run to four games thanks to a Tunde Bayode goal. Barnsley created the first clear cut opportunity of the match as Jacob Brown linked up with Kane Swinburn before the latter’s shot sailed just wide of the target when it looked like Burnley goalkeeper Aiden Stone was beaten all ends up. However, the Clarets responded well and within a minute they should have been ahead when Bayode whipped a cross into Tinashe Chakwana but he fired his effort over the crossbar from point blank range. The Tykes were playing some fine football and they were inches away of taking the lead on 39 minutes as Matthew Wolfe tried his luck from range, but his effort deflected of James Clarke and sailed wide of Stone’s right hand post. It was the side wearing White who created the next opening on 41 minutes in a nervy first half as Will Smith played a superb pass out to Swinburn, but his cross was well dealt with by Clarets Keeper Stone racing off his line to claim. 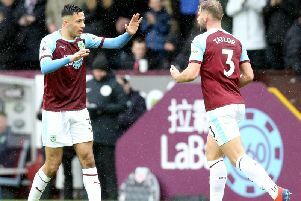 Burnley started the second half on the front foot and immediately had a good chance to open the scoring as Harry Limb ran from deep before being tackled by Romal Palmer the ball however fell to Bayode but he lashed his strike over the crossbar. Jack Walton in the Barnsley goal was then forced into making a fine low save on 51 minutes as he pushed away a low freekick from Bayode as the ball looked set for the net. Barnsley should have been ahead midway through the second half as Rhys Dolan crossed for Victor Adeboyejo but he flicked his header wide of the target when he should have at least forced a save out of Stone. Walton then had to be alert two minutes later as he made another good save from a freekick as he kept out a rasping effort from Rahis Nabi holding the ball in the process. As the Clarets started to up the tempo they were inches away from taking the lead on 66 minutes as neat build up play resulted in Arlen Birch volleying a Ali Koiki cross wide of the target from outside the area. Burnley then had their best chance of the game as Bayode skipped his way past the static Barnsley defence before his effort lacked power and easily saved at the near post by Walton. However, two minutes later the young Clarets did go ahead after the impressive Bayode was played in by a superb Nabi pass before placing the ball past the onrushing Walton. On 78 minutes it was nearly two when Chakwana crossed for Jamie Thomas, but he couldn’t get a clean connection on the shot allowing Walton to claim the loose ball at ease. The Clarets were playing some fantastic football and could have doubled their advantage when Bayode once again skipped past the Tykes defence before he squared the ball to Tommy Wood before his shot was once again well saved down low by Walton. Barnsley then were nearly on terms in added time as Sam Fielding whipped in a freekick that was spilled by Stone only for the keeper to recover well and claim the loose ball as Adeboyejo was lurking to score. BURNLEY: Stone, Birch, Koiki, N’Guessan, Clarke, Wilson, Nabi, Thomas, Bayode, Limb, Chakwana. Barnsley: Walton, Smith, Wardle, Palmer, Fielding, Lund, Swinburn, Wolfe, Adeboyejo, Brown, Dolan.